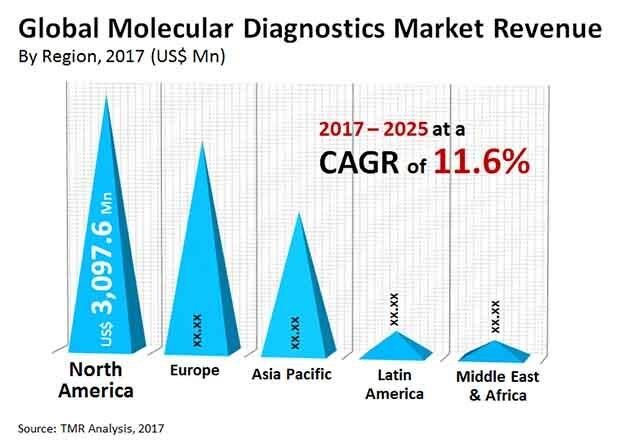 The global molecular diagnostics market features a highly consolidated vendor landscape, with the top three players, namely F. Hoffmann-La Roche Ltd., Abbott Laboratories, and Danaher Corporation, representing over 54% of the overall market. The dominance of these players can be attributed to their broad product portfolio, finds Transparency Market Research (TMR) in a study. “Several players are going the mergers and acquisitions routes to stay ahead of the curve. For instance, Danaher acquired Cepheid in 2016 which is poised to the operational efficiencies and expand their diagnostic units,” says TMR’s lead analyst. The valuation of the global US$7.10 bn in 2016 and is estimated to reach US$18.98 bn by 2024, exhibiting a CAGR of 11.6% from 2017 to 2025. On the basis of end user, diagnostic laboratories will continue to dominate the market until 2025, accounting for 38.5% of the overall market value. The availability of well-equipped and sophisticated instruments in diagnostic labs make them a preferred choice for diagnosis. The segment is expected to register a strong growth during the forecast period. Geographically, North America will continue to be at the forefront of growth until 2025. Changing demographics, growing incidence of cancer, and well-established healthcare infrastructure are contributing to the dominance of the region. Asia Pacific is anticipated to post a noteworthy CAGR of 12.2% during the same period, owing to the improving healthcare infrastructure and the increasing acceptance of technologically advanced products. Governments worldwide are allocating significant budgets to the healthcare sector, which in turn influences diagnostics healthcare. For instance, in 2015, the overall share of the U.S. economy devoted to health care spending was 17.8%. Therefore, the increasing government funding is augmenting the global molecular diagnostics market. Moreover, the growing inclination towards personalized medicines is translating into the greater uptake of molecular diagnostics worldwide. Another important factor stoking the global market is the rising prevalence of infectious diseases and cancer. “Expanding base of patients suffering from cancer is creating a soaring need for efficient and target-specific medicines, which in turn is triggering the demand for personalized medicines,” says a TMR analyst. The trailblazing researches in the field of biomarkers are also working in favor of the market. Furthermore, continuous advancements in technology, growing global geriatric population, and improving consumer expending power on healthcare are providing a fillip to the market. The complex regulatory scenario is leading to delays in the introduction of new treatments and also makes them expensive, which in turn is negatively impacting the growth of the global molecular diagnostics market. “Insurance companies are refraining from reimbursing molecular diagnostic tests due to lack of appropriate coding system,” says an analyst. This is leading to unfavorable reimbursement scenario, thereby negatively impacting the growth of the market. Moreover, the lack of awareness and ambiguities related to molecular diagnostics are adversely affecting the growth of the market.